The automobile industry is undergoing a digital transformation that is powered by Internet of Things (IoT) and other digital technologies — and the race to build the fully connected car, and ultimately the completely autonomous vehicle, is already underway. Auto manufacturers are producing connected cars and drivers are getting used to experiencing increasing amount of digital technology in their cars. It’s obvious that connected cars offer drivers a lot of benefits compared to their predecessors. Many of the normal features of the car, such as collecting performance data (speed, fuel efficiency, and gas tank levels), heating and air conditioning, playing music, etc., have been digitized to provide the driver and occupants with easier operation and better overall driving experience. Connected cars, aided by the smart phones and other devices in the car, are also able to stream music from the cloud, provide real-time traffic information and personalized roadside assistance. Recent innovations allow automobiles to monitor and adjust their position on the highway, alerting drivers if they are drifting out of their lane, and slowing down if they get too close to the car in front of them. The convergence of technology and the automobile has unleashed innovations in safety, navigation, entertainment, and now, health. There are a few key trends driving innovation in digital health in the car: changes in the car interface around personalization and connectivity, the introduction of embedded smart sensors, and growing consumer interest in health monitoring devices and apps. Furthermore, delivery of healthcare services is shifting to in-person, in-home and now in-vehicle patient interaction and support. Areas outside hospitals – smart homes and connected cars – will clearly become new points for measuring, monitoring, diagnosing and communicating with individuals about their health. From alcohol detection, alerting a driver under stress to detecting an impending health abnormality such as a heart attack, a connected car outfitted with the right smart sensors can go well beyond providing comfort and safety to the occupants – it can also save lives. This session will explore the impact of IoT on the way we travel in our cars and the evolution of wellness monitoring in connected cars through smart sensors. We will discuss how some of the new/innovative smart sensors being embedded into our cars and homes can help us monitor and manage our wellness better, while providing new channels for delivering care away from centralized points of care (such as hospitals and clinics). 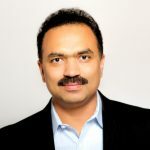 Founder & CEO at Kollabio, Inc.
Ashok Nare is the Founder & CEO of Kollabio, Inc., a Digital Transformation company that combines strategic thinking and technology expertise to create unique digital experiences to address the unique challenges and opportunities offered by today’s hyper-connected world and modern day digital networks. Mr. Nare has over 20 years of hands-on, leadership and executive experience in enterprise software development, technical leadership and corporate operations. He served as a CTO at multiple startups prior to starting Kollabio, where he was responsible for new product development, building high performance technical teams and establishing technology strategy and vision. His areas of expertise are Digital Strategy, Digital Transformation, Internet of Things (IoT), Architecture, Cloud Computing, New Product Development and Agile Software Development. He is an avid promoter of IoT and Digital Health technologies and is a frequent speaker at Health & Technology conferences including mHealth Summit 2015, Health Slam 2016, Smart Cities Symposium 2017 and Heart and Stroke Innovation Forum 2017.